Casa Bella, is a newly renovated event facility in the quaint town of Sunol, is built based off of more than 30 years of experience within weddings and events. The interior of the facility is designed to maximize the space and give an incredible intimate feel. Casa Bella hosts a quaint brick patio surrounded by beautiful landscaping, and an indoor reception hall. Nestled around a few local wineries, Casa Bella is a great destination to hold your special event surrounded by beautiful scenery. With prime location between Fremont and Pleasanton, Casa Bella is the perfect location for weddings, meetings and events for our Bay Area neighbors. Our venue with state of the art audio, visual and PA system. With weekday and weekend ability and indoor outdoor accommodations, we are able to host group sizes both small and large. Our indoor facility provides table seating for up to 200 guests, or 300 guests cocktail style. Our outside facility hosts a patio and garden, lit by bistro lights providing another spacious and beautiful area for use. Parking is available across the street in walking distance, we have a trolly available for transportation. Our newly designed venue houses up to 200 guests and hosts a mix of modern elegance with rustic charm. 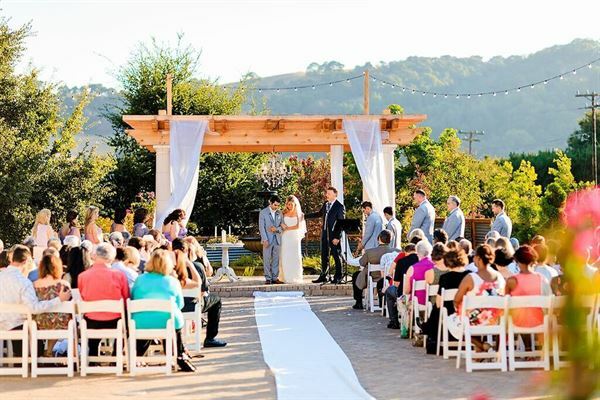 Our ceremonies take place outdoors on our brick patio underneath a stunning grand pergola and surrounded by the beautiful landscape of Sunol. Special Features: All systems are new & easily manageable. Lighting: recessed colored rope lighting, 24 colored uplighting, 120 pendant glass ball lights, 12 crystal chandeliers. Visual: 150 inch drop down screen, high quality projector.